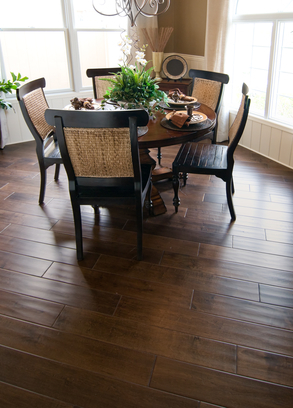 Nothing adds more beauty and elegance to a house than hardwood flooring. However, a number of people believe that it should never go beyond the kitchen door. The kitchen is considered an area prone to wetness and the general assumption is that it is no place for wood flooring with all its spills of water and other liquid kitchen necessities. Admittedly, some of the fears about the damage kitchen water would do to a wood floor are founded—but only partly. The kitchen is not the place for every type of wood. However, there is no reason you should deny yourself the gentle, warm touch of hardwood under your feet as you go about your business in the kitchen. As a good number of kitchen magazines prove, installation of hardwood floors is gaining popularity fast. In fact, it has been accepted as a trend among modern homeowners. It all boils down to the type of hardwood used and the quality of the installation job. Unlike pre-finished hardwood which is stained and sealed in the factory, site-finished hardwood arrives at your home with no stain or seal. Its surface features only raw wood. The stain and sealer are only applied when the installers finish nailing it down. Remember, the installation of both the pre-finished and site-finished hardwood flooring is done through the same method – tongue and groove. Nonetheless, the site-finished installation job has the benefit of application of a thin, cohesive layer of sealant from one end of the surface of the floor to the other. It is, therefore, rendered impermeable. When for some reason you cannot install site-finished hardwood flooring in your kitchen, there is still another option. If you keep the quality high enough, engineered hardwood is as good as solid hardwood, sometime better. One of its most beneficial features is its cross-layer make-up which enables it to resist the effects of high humidity and moisture. In addition, it has a top veneer engineered to prevent water from seeping through it into the wood beneath. Apart from ability to resist the effects of water and other liquids, there are factors that will surely determine how long your kitchen hardwood flooring will remain intact. The kitchen is accessed by almost everyone and, therefore, it experiences more traffic than some of the other rooms in the house. It is inevitable that after some years, the marks of heavy traffic will begin to show. There is no cause to worry, however, since you can easily screen or sand them down. You need to protect your hardwood flooring from scratches and dents. In most cases, using a throw rug is good enough. However, bleaching may occur on the parts left unprotected if your kitchen is exposed to strong sunlight. If you visit the Relative Space website, you may be able to find more information.